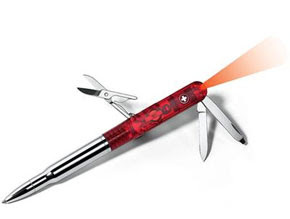 The Swisspen combines a multi-tool and a pen, it can be seen as a Victorinox classic mounted on top of a pen with the addition of a LED flashlight. The tools included are scissors, letter opener and the file, the section of the pen with the tools can be detached to help using the scissors. The cross logo can be pressed to activiate a small led flashlight that can run for about 10 hours using a coin cell battery. The pen itself uses a twist mechanism to hide the writing tip and the ink cartridge is pressurized meaning the pen will write in difficult scenarios such as upside down or over greasy paper. We found the writing fine without smears the trace is thick and clear and the ink doesn't get dry if you don't use it for some weeks. The weight is balanced to make writing pleasant even having some tools at the pen top, as a result the pen is quite heavy and might be used as a kubaton by trained hands. The tools work well as expected but the pen is sometimes a very strange grip so you are not as confortable using the file or the scissors as you would be with a SAK. We found this a combo that priorizes the pen over the multitools so it is a good gift for people that want a pen and would like some extra tools handy in case of need. You can read more and check different models from Wagner's website, or order for about $40 from knifecenter.